I always wondered if you guys has learned this techniques in the movie industry with another proprietary software and the applied it to blender, or has you done this the first time in blender??? I learned it while I worked in movie industry. I use this method in Nuke, Fusion, etc, and its works perfect with Blender also. I was wondering the same thing. I looks like quite a steep learning curve! It looks like you feather to the objects edge instead of doing the outline on the exact edge, is this correct? Yes, exactly. It helps a lot especially when you have huge motion blur. But when I did this shot (7_2e) we didn’t have motion blur for masks. Clueless vfx noob question here. What exactly is masking used for? Is it just for limiting the area that the composite nodes have to calculate for, or is it actually an extraction tool in its own right? Or do I have completely the wrong idea? I’ve been lurking around the blog since it got started, and I’ve learned a lot and had fun reading it. I can’t wait to see the final product of all of your hard work. The stuff that’s been put up here looks stunning. Masking can be used for many things. On Mango its mostly used for Matte creation. A matte is a greyscale image that defines the areas of your plate that you want transparent. Whatever is white will remain, and the black will become transparent. So you can isolate an actor from their background and insert them somewhere else. Masking also can aid green screen keying. Masks can also isolate parts of the image for say, color correction. Thank you to everyone who answered my question. I have a couple more now, since questions breed like rabbits, but I’ll try to make these the last ones. Other than removing tracking markers, why would one use masking to aid green screening? Also, in the image, the head of the character is clearly not over a green screen. Here it is relatively easy to mask out, due to the character’s hair cut, but with a character with longer hair and messier hair, how would one mask in an efficient manner and preserve the hair, particularly if the background was more complex than the somewhat even, blank surface behind the character in the image here, preventing matte nodes from being employed effectively? Sorry. Something of a run-on sentence. Thanks in advance. A couple of weeks ago, there was a post showing how the mattes where made for one of the scientists. A lot of tweaking indeed goes into the hair! In simple terms, masking basically creates a cutout in the frame. So lets say you have a figure walking across screen and you want to show him walking in front of a space port (which you’ve already created a plate for in Blender). But you didn’t actually shoot the figure walking in front of a green screen. Well, to accomplish this, you’d have to somehow cut the figure out of the clip so that way you could put in your plate and it would look like the figure was in front of the plate, not behind it. This is what masking does. You isolate the figure and turn anything other than the portions you’ve isolated into Alpha. 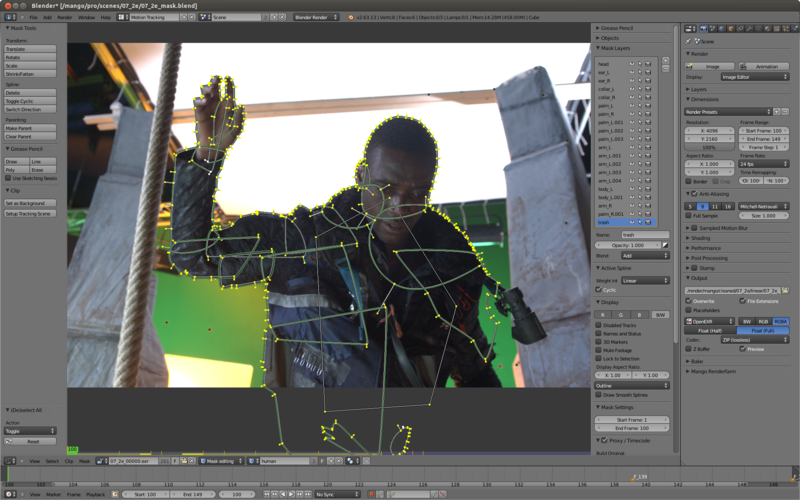 Now you have a figure walking across alpha, which is much more usable for compositing. There are other kinds of masking too (technically, you could make the figure alpha instead of the background), but not as common. Great break down of masking. I just did it the dumb way and all those bad things happened. Going to go back and make my mask modular now! Thanks. The answer is simple – because there was not enough time. As always. I have just tried this method out and it is soooo much better for minimising the migtration of verts around the mask shape. But I have one observation. Is there a way to solo the mask shape that you are currently working on? That is hide all except for the active mask shape. I have found that the overlapping masks can get hard to discriminate between. To many verts near each other means you often select the wrong one or the wrong linked mask. I know you can hide masks by poking the eye in the mask meu but that is a very slow way to wrk when you are editing a mask shape over time in a fast fluid manner. Sorry all, I see that Shift H is hide all non-selected. Essentially a solo of the currently selected item.